FC29A in the Hyperflow of History. Covered in multimedia lecture #4124. Rome's first overseas wars were against Carthage on the coast of North Africa, the largest, most prosperous, and aggressive of the Phoenician cities. The prize they fought for was the island of Sicily, which for centuries had been a constant battleground between Carthage and various Greek colonies. Neither side had won a decisive victory, and when Rome got involved, the island remained divided between Carthage in the western end of the island and the Greeks in the east. 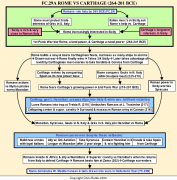 Rome's relations with Carthage down to 264 B.C.E. had been friendly. The two powers had even allied around 500 B.C.E. against the Etruscans. By this treaty Rome recognized the Mediterranean as Carthage's sphere of influence, and Carthage even claimed a Roman could not wash his hands in the sea without its permission. As long as Rome was just a land power preoccupied with conquering Italy, this arrangement was fine. However, in 264 B.C.E., with Italy firmly under control, the Romans first got involved in Sicilian affairs. There were several reasons for this war. For one thing, both Rome and Carthage saw Sicily as a natural extension of their respective territories. Similarly, the Greeks in Southern Italy felt Sicilian trade and resources were rightfully theirs to exploit and probably put pressure on Rome to protect their interests there. The immediate cause of this war was a group of Italian mercenaries called the Mamertines ("Sons of Mars") who had seized the strategic port of Messana just across from Italy. The Romans, seeing the port as vital to the security of Italy, helped the Mamertines when Carthage moved to take the city, and this led to war. The First Punic War (264-24l B.C.E. )resembled the Peloponnesian War between Athens and Sparta, in that each conflict pitted a land power against a sea power where one side would have to attack the other side's strength. In each case, it was the land power that built a navy. Roman experience with a navy up till now had been limited, which seems surprising considering how much coastline Italy had to defend. However, probably with the help of Greek shipwrights in the south, the Romans built a fleet with which to challenge Carthage. The Romans realized they could not match Carthage's centuries of experience in naval warfare. As a result, they adapted a heavy boarding bridge, known as the corvus ("crow"), from the Greeks. Any Carthaginian ship daring to get close enough would find this bridge slamming down on its deck and Roman soldiers pouring over to capture it. In essence, the Romans were turning a sea battle into a land battle. As ridiculous as it seemed, it worked. Time and again, Roman fleets crushed Carthaginian fleets and were steadily sweeping Carthage from the seas. However, Rome had one very powerful enemy that evened things out: Mother Nature. It seemed that for every Carthaginian fleet the Romans destroyed, a storm would rise up to demolish a Roman fleet. Thousands of lives were lost on each side with neither Rome nor Carthage making any headway or willing to quit. For twenty years the war dragged on, bleeding each side white. Finally, in 24l B.C.E., the Romans mounted one last supreme effort to build a fleet, this time without the heavy corvus to weigh down the ships. As luck would have it, they caught the last Carthaginian fleet loaded down with supplies and destroyed or captured most of it. Carthage had had enough and sued for peace. Rome took 3200 talents (2ll,200 pounds) of silver and three- fourths of Sicily, leaving its ally Syracuse with the other quarter. Sicily became Rome's first province, having little prospect of Roman citizenship since, in Roman eyes, the Sicilians were too different to be able to share in the benefits of Roman rule. Rome was quite active in the years after the First Punic War. To the north, it conquered the Gauls in Northern Italy, known as Cisalpine Gaul ("Gaul this side of the Alps"), thus extending Roman rule all the way to the Alps. To the east, the Romans crushed the Illyrian pirates operating in the Adriatic Sea. Although this was done mainly to protect the shipping of the Greeks in Southern Italy, the Macedonian king, Philip V, viewed it as an act of aggression by Rome in his home waters. Another power getting concerned about Roman power was Syracuse, which found itself hemmed in by Roman rule in most of Sicily. Then there was Carthage. In 238 B.C.E., when Carthage was still weakened from the First Punic War, Rome seized Sardinia and Corsica, two islands off the west coast of Italy that it saw as a threat if they remained in Carthaginian hands. However, the Carthaginians were a resilient people who were not about to accept Rome's victory for long. Soon after the war, Carthage's most capable general, Hamilcar Barca, set off for Spain to carve out a new empire for his city. Over the next twenty years, Hamilcar, his son-in-law Hasdrubal, and Hamilcar's own son Hannibal, brought most of Spain, with its plentiful silver and mercenaries, under Carthaginian rule. As Carthaginian power revived in the West, Rome became increasingly nervous. Finally, war broke out when Hannibal attacked the Spanish city of Saguntum, which was an ally of Rome. The Second Punic War (2l8-20l B.C.E.) would be an even more desperate struggle than the first war with Carthage. The Carthaginian general, Hannibal, was a brilliant commander who figured the best way to beat Rome was to invade Italy so Rome's subjects would desert to his side. Since the Roman navy was too strong for him to risk an invasion by sea, Hannibal took the only remaining route, over the Alps. This march, which involved taking some 40,000 men and 37 war elephants through hostile Gallic territory and treacherous mountain passes, certainly ranks as one of Hannibal's most remarkable achievements. Only some 25,000 men and one elephant survived this march, and the Romans immediately moved north to finish off Hannibal's sick and exhausted army. However, it was Hannibal who, over the next two years, dazzled the Romans with an array of tricks and strategies that trapped and destroyed one army after another. The most devastating of these battles, Cannae (216 B.C.E. ), was a masterpiece of strategy using a collapsing center to draw the Romans in and then envelop their flanks. The ensuing slaughter cost Rome 35,000 men. Cannae unleashed a virtual avalanche of problems on Rome as other states, nervous about Roman power, flocked to Hannibal's standard. Syracuse joined the Carthaginian side. Philip V of Macedon, fearing Roman encroachment in the Adriatic, also allied with Hannibal against Rome. In Italy, both the Gauls in the north and the Greeks in the south defected to Carthage's side. However, Hannibal was disappointed that the overwhelming revolt against Rome never took place. Instead, the central core of Italy stood fast by Rome, producing more armies as Rome pursued new strategies. In their darkest hour after Cannae, The Romans displayed incredible spirit and determination. They defiantly refused to ransom soldiers who had surrendered at Cannae and forbade any talk of peace or even public mourning that might lower morale. They quickly put Syracuse under siege, found allies in Greece to keep Philip V of Macedon too busy to be able to help Hannibal in Italy, and raised armies to invade Spain and deprive Carthage of its main resource base. In Italy, Roman armies gradually pushed Hannibal into the South, while being careful not to test his wizardry in open battle. Instead, the Romans, using superior manpower and resources, gradually wore Hannibal down while chipping away at his supports elsewhere. It was a slow exhausting strategy that required remarkable perseverance. But in time it bore fruit. Macedon was neutralized. Syracuse fell after an epic two-year siege. Spain was gradually stripped from Carthage's grasp. And two relief armies sent to Hannibal's aid were destroyed in the north before reaching him. Hannibal managed to hang on tenaciously in southern Italy as he saw even his Italian allies melting away under growing Roman pressure. Finally, the Romans mounted an invasion of Africa that forced Hannibal to return home. At Zama, the brilliant Roman general, Scipio, used Hannibal's tactics against the old master to crush his army and bring Carthage to its knees. Rome deprived Carthage of Spain, most of North Africa, 10,000 talents (660,000 pounds) of silver, all its war elephants and all but ten warships. Its African lands went to Rome's ally Numidia, while Spain remained to be conquered. The quarter of Sicily around Syracuse also fell to Rome. Rome had arrived as the dominant power in the West.